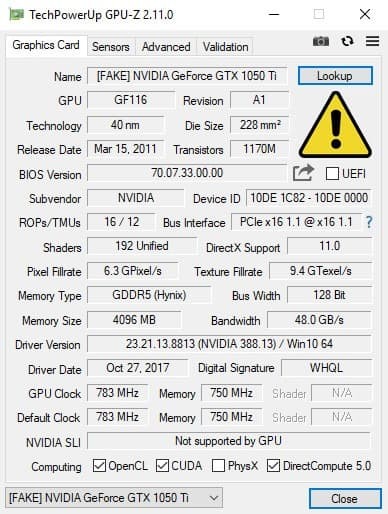 The latest version of the popular video card tool GPU-Z includes a new option to detect and highlight fake NVIDIA cards. Fake video cards appear as more powerful video cards on cursory inspection and scammers sell these for a higher price on marketplaces on the Internet and even in retail stores. Users may never know that they bought a less-performant GeForce GTS 450 video card instead of the GeForce GTX 1060 that they wanted to buy. Scammers manipulate the BIOS of the video card so that it appears as a different graphics card that is more powerful and thus more expensive. While GPU-Z's new capabilities may not help prevent purchases of fake video cards, it may very well help users identify fake and do something about it. Whether you may be able to get your money back or even get the merchant dispelled from a marketplace depends entirely on where you bought it. GPU-Z displays a [FAKE] in the name field when users run it if it detects that the video card may be fake. A big exclamation point is displayed as well. The program detects fake graphics cards that use old NVIDIA GPUs that the scammers labeled differently. The initial fake version detector supports the NVIDIA GPUs G84, G86, G92, G94, G96, GT215, GT216, GT218, GF108, GF106, GF114, GF116, GF119, and GK106. One interesting aspect of the implementation is that it is forward compatible so that new fakes will also be detected by the application provided that the scammers use the same techniques to create fake video cards. It may be a good idea to run GPU-Z each time you buy a new PC or a video card to verify that it is genuine and not manipulated. The new version of GPU-Z comes with a set of additional features that improve NVIDIA Turing support and improve capabilities for all NVIDIA cards. Turing is a GPU architecture by NVIDIA that is supported by the company's GeForce RTX platform (the GeForce 20xx series of video cards). GPU-Z supports options to save and upload the BIOS of NVIDIA GeForce RTX 2000 graphics cards, and to monitor multiple independent fans used by these cards. Last but not least, HDMI and DisplayPort information is now listed under Advanced > NVIDIA. Now You: Do you test hardware after you buy it? I am seeing on your picture with the article that you are using the Video card software from TechPowerUp GPU-Z v.2.11.0 (released on ’18-09-17). There is already a newer version TechPowerUp GPU-Z v.2.12.0 (released on ’18-10-12). Screenshot is from a test version of the app. I believe GPU-Z offer you to upgrade on startup if a new version is available. I ran it and it discovered that my computer was in fact an empty plastic case ! All these years without knowing the truth ! I was wondering why I had never heard of GPU-Z, and suddenly it hit me: I don’t have a graphics card! Good to know about it, however, for general reference. Just out of curiosity, are a lot of these fake graphics cards being sold through Amazon? I’ve read that Amazon hasn’t been doing enough to police counterfeit products. I believe GPU-Z also supports “built-in” graphic cards (Intel and AMD APU) and it’s a useful tool to have around to monitor your GPU temperatures, usage and other things. I’d say most of the fake cards are sold on ebay or aliexpress. But there are some legit cards that may look like fakes, for example Nvidia sells only 3Gb and 6Gb models of GTX1060 but there’s also a 5Gb model which most people probably don’t even know about because it’s exclusive to China (but you can get on aliexpress or ebay). Thanks, RzRz. Good to know. Does GPU-Z work on Linux via Wine? Thanks to GPU-Z I found that I got a fake one from china (duh!) So I tore it apart to see what the chip said – it too is smoothed off – so how can you tell what wimpy gpu you have? @Lou: Do your remember where you bought your fake graphics card?